We aren’t surprised that the Governor of New York, an avid gun grabbing megalomaniac, runs a vitriolic diatribe on the back of acidic foam protruding from his dirt filled mouth. “Do something” he tells the President of the United States. “This isn’t about you, it’s like you can’t help yourself. You were elected to help NYS, so NYers should be your priority. Sincerely, an ACTUAL taxpayer of NYS, commuter (when the trains work) and NRA member,” one Twitter user replied. 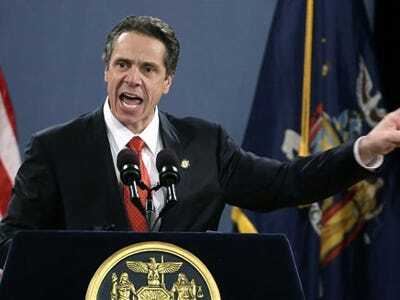 “Why don’t YOU do something in the State of NY that is so terrific that the rest of the States in the USA will follow? IT IS TIME FOR YOU TO LEAD!” another added.